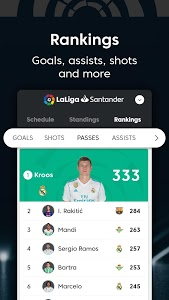 Experience all the thrills of the 2018-2019 La Liga and Europa soccer leagues in the new Official La Liga App. 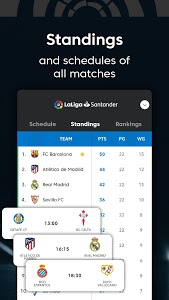 Get the news on all the matches in the La Liga 2019 calendar. 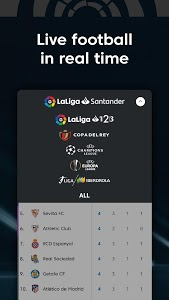 You can find news about the Santander League (First Division), LaLiga 123, Copa del Rey Cup, UEFA Champions League, UEFA Europa League, and Iberdrola League (women's soccer league). 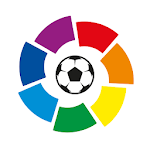 Live Spanish and International soccer highlights and goals, calendar, and live soccer info. 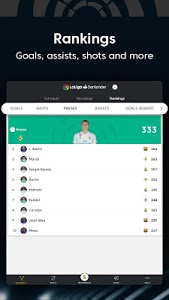 Enjoy the best news content about your favorite Spanish soccer teams and players: Real Madrid, FC Barcelona, Atlético Madrid, Sevilla, Messi, Bale, Griezmann, Luis Suárez... 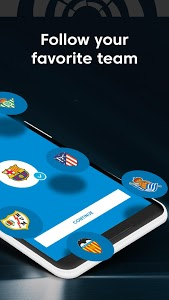 Experience the king of sports as never before using the new official soccer league app.
? 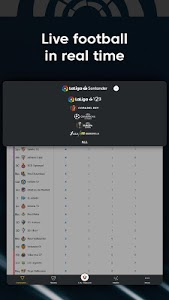 Schedule, sports results, standings, and live goals: Santander League, 123 League (Second Division), Copa del Rey Cup, UEFA Champions League, UEFA Europa League, Iberdrola Women's League, and more.
? Live info: Watch each second-to-second highlight live for all the soccer matches. You can follow user discussions and add comments every day on Twitter as well. 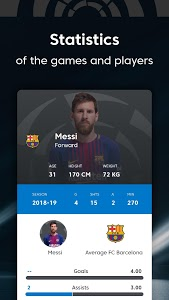 ⭐ “My Favorite Team” section: Personalize the app with your team's colors and details to get fast, easy access to coming and played matches, players, stats, goal scorers, social networks, soccer highlights videos, pre-match info, and all the news about your favorite teams.
? 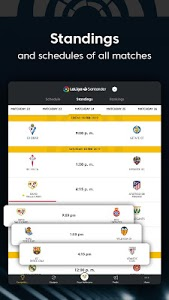 Notifications: Thanks to the Official Spanish Soccer App's push notifications, you can set up alerts about anything that happens in your favorite teams' live soccer matches, and stay up-to-date on soccer fixtures: the day's schedule, line ups, match kick-off and end times, goals scored, live results, match highlights video, red cards, substitutions, and more. You'll also be able to configure them just the way you want, according to your favorite team and your preferences. 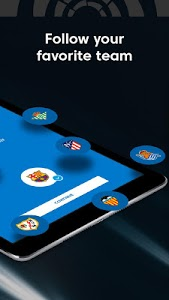 You decide which alerts you want to receive for the best coverage of live matches.
? 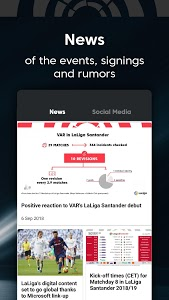 Soccer News: Receive the latest info on Spanish teams, live scores, players, the top scorer, national leagues, European championships, and 2019 League press releases. Watch the best pre-match info and match highlight videos and other news from the world of soccer.
? 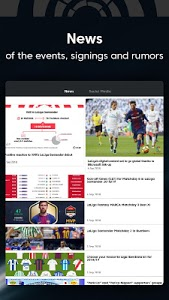 Social Networks: All the LaLiga profile info and apps on Facebook, Twitter, Instagram, and YouTube. 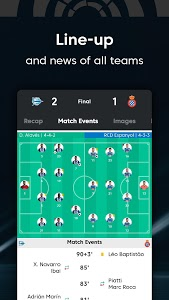 ⚽ “Teams” section: With the newLeague App you can access everything about your favorite team. Watch up-to-date multimedia content with photos and videos; find schedules and sports scores; check the most important team and stadium info; look up the squads and team and player stats. Get soccer on your cell phone! 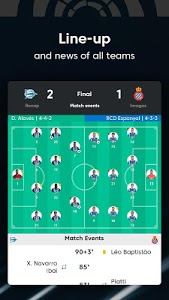 Download the only official soccer league app now for free, enjoy all the best from your favorite soccer teams, and see all the scores live: Alavés, Betis, Getafe, Levante, Athletic, Celta, Girona, Real Sociedad, Atlético, Eibar, Huesca, Rayo, Barcelona, Espanyol, Leganés, Real Madrid, Sevilla, Valencia, Valladolid, Villarreal, Albacete, Alcorcón, Almería, Cádiz, Córdoba, Deportivo, Elche, Extremadura, Gimnástic, Granada, Las Palmas, Lugo, Málaga, Mallorca, Numancia, Osasuna, Majadahonda, Oviedo, Zaragoza, Reus, Sporting, and Tenerife. UI updates, bug fixes and performance improvement. 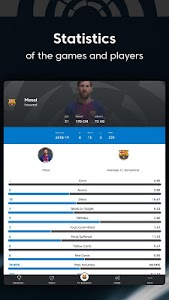 Similar to "La Liga Live Soccer Scores, Stats, News Highlights"